John Harbison and Michael Gandolfi, the directors for Tanglewood’s Festival of Contemporary Music (FCM), have assembled a program that has a strong sense of nostalgia and homecoming. Perhaps since both are composition alumni from the Tanglewood Music Center (Harbison in 1959, Gandolfi in 1986), of the 26 composers whose work appears during the festival, 20 were themselves previous Tanglewood Music Center Composition Fellows. Thursday night’s opening concert was right in line with that overall balance, four of the six pieces coming from alumni, three of them constituting the somewhat nostalgic second half, where most recent piece came from 1979. The first half was dedicated to recent pieces from relatively “young” composers, ranging in age from 44 to 49. This contrast in the program was balanced by other symmetries—two pieces that directly addressed despondent emotional states, two that set ecstatic literary texts, and two that placed formal process at their center. The concert opened with two composers who were receiving Tanglewood premieres. Englishman Robert Burton’s huge opus from 1621 provided the title and perhaps inspiration for the evening’s opener, The Anatomy of Melancholy by James Matheson, a Brooklyn based composer who accomplishments include commissions from the orchestras in Chicago, New York and Los Angeles. The music does not attempt to compete with its namesake’s size, clocking in at about a quarter hour, and in fact the connection to Burton’s work is tenuous at best. The piece hasn’t Burton’s outsized personality and unstoppable garrulousness, but it does exhibit a variety of “anatomization”, assembling and dissecting music starting from a simple descending scale. Scored for the Quartet for the End of Time ensemble of clarinet, piano, violin and cello, Anatomy evokes the spirit of Messiaen (whom Matheson lists as an influence) in the extremely slow statement of that scale in the piano. A sudden ascending flurry of notes in the clarinet and violin follow, and shortly there after the clarinet sings a wandering melody. The work develops and transforms these ideas: fragments chase each other in near-canon spaced only a beat or two apart; rhythmic frenzy immediately gives way to long lines placed so as to obscure the beat; timbral effects abound, especially in the accentuation and coloring of attacks. The mood is brooding, if not exactly melancholy to my ear; the musical language is chromatic but singable; and the music’s structure is that of more or less constant variation, but with no clear boundaries, episodes trading places quickly or bleeding into one another. 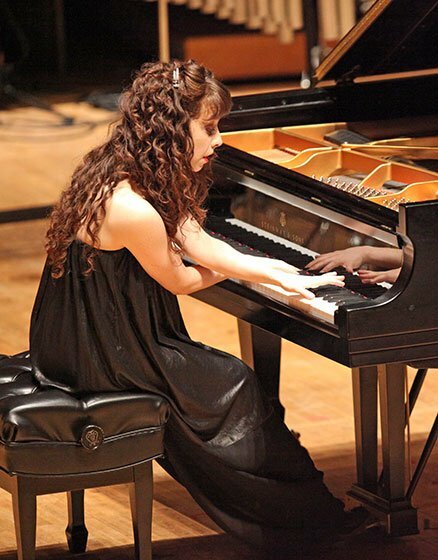 The performance was dominated by Samuel Almaguer’s clarinet, which produced finely graded, beautifully controlled dynamics; and by Mika Sasaki’s piano, whose tone was clear and ringing, if a bit chilly and severe. Kuan-Yu Annie Chen’s (violin) precise pizzicato gave a sharp edge each time it was called upon to adorn an entrance, and although the Ren­­ée Delgado (cello) had less room to shine, she did provide a beautifully, appropriately dour extended ostinato in the middle. It was ear-catching and intriguing: there’s a sense of layering or planes of sound which connect and disconnect, exchanges of repeated gestures alternating with moments of independent discourse. It moved quickly and elusively and was the item I would most like to have heard again so as to better penetrate its workings. Anna Weesner currently teaches at the University of Pennsylvania, and her piece Mother Tongues sets poems from the Philadelphia-based poet Sonia Sanchez. The poems are four intense and concentrated haiku on themes of love and desire. Despite soprano Claudia Rosenthal’s regal bearing and imposing voice, and the precise and committed performance of the chamber ensemble (clarinet, violin, viola, cello and piano), I found it at odds with itself. Sanchez’ poems gain much of their force from their extreme brevity and formal constraints, while the musical language of Mother Tongues was at times indistinct, even blurry. The texts were set more or less conventionally, meaning words often lasted much longer than in speech, and were occasionally repeated: this did not add to their impact. Neither did some odd choices in setting the text: displacing the word “ocean” in the second haiku to highlight some sound-painting of waves, for example, or closely grouping the words “well so” in the lines “let me wear the day/well so when in reaches you,” giving them an odd emphasis. Weesner’s explanation for the title is also a bit opaque, describing her “multiplicity” of influences and concluding: “Once the pencil is moving and the ear is tuned in, that multiplicity has to simply be, letting it all somehow coalesce as mother tongue.” I’m not sure what that means, and I found a similar energetic fuzziness in the music. The work had a pleasant surface with distant inflections of blues and jazz, and Weesner knows how to paint with sound, creating swashes of very attractive colors from the chamber ensemble, but sound and the texts were aiming for different aesthetic goals. The two outer sections of Seung-Ah Oh’s Canonic Phase were the most engaging and enjoyable moments of the evening. Oh was raised in Korea, studied in Boston at Brandeis, and now has a career split between Chicago and The Hague. In Canonic Phase four percussion players have two sets of four instruments—one set made of wood, one of metal (“metal” includes skinned drums). During the course of the piece the players gradually move from wood to metal and back again, playing canonical figures transformed through processes that the composer says are based on prime numbers. If this sounds forbidding, the result is absolutely engaging. 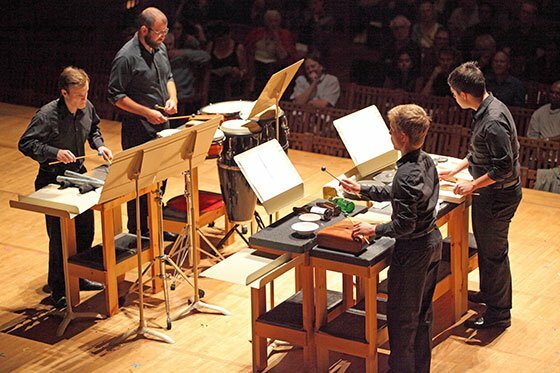 Any process piece for four percussionists carries the ghost of Steve Reich’s Drumming; its limited vocabulary, very strict process and extended time scale, is a severe precursor to Canonic Phase, where the varied rhythms and the fast changing surfaces were propulsive without ever settling into a single meter or forcing itself into a groove. Canonic Phase embraces complexity, but that complexity is embedded in a generative process that creates constant moments of recognition and surprise. As musical material flew about the ensemble, the mind chased after it, until some new arrival caught its attention. It was intellectual and infectious at the same time. The middle section dwelled on the change in timbre, the rapid-fire attacks replaced by rolling figures; this was paradoxically harder to follow, as the texture became denser and the slower figures were less memorable. The performance by Kirk Etheridge, Joseph Kelly, Michael Jarret and Brian Maloney, was electric at its best, and never less that full-throated and confident. The second was odd—made up of much older compositions by much older composers. Jacob Druckman’s Bō, for a wordless trio of female voices, bass clarinet, harp and percussion, was written when the composer was 51 in 1979 and was the only piece that represented a mature work in the second half. Written partly in response to the Southeast Asian “boat people” crisis, it is dark and filled with longing and an undercurrent of fear: the vocal trio sings in close harmonies as if huddling together, and occasionally break out into sounds of obscure speech, as if whispering desperately. The harp and percussion (primarily marimba) create floating environment with occasional outbursts, and the bass clarinet acts as a continuo, reinforcing the low end of the music. Having a kinship with some of the more active works of Morton Feldman, it also has a gentle arch shape to it, it conjuring a single mood with gentle shadings from moment to moment, like clouds over the sun, without ever quite letting it shine free. Aram Demirjian directed a solid performance. Fred Lerdahl’s Wake (from 1968) embodies something of a 1950-1960’s cliché, being written for a widely varied ensemble (soprano, violin, viola, cello, harp and three percussionists) which sets texts from Finnegans Wake in expressionist, atonal music. Joyce’s text has inspired all manner of settings despite its formidable complexity and the fact that they depend as much on typography and a sense of dialect as they do on the words themselves. Most do not succeed. This setting doesn’t do the texts any favors; the soprano’s line jumps and winds, often landing at extremes, with complex rhythms that almost always obscure the pulse, making a text already difficult to parse frequently unintelligible. It’s an early exemplar, rather unlike much of Lerdahl’s later work, and it overstays its welcome at 15 minutes. It did function excellently as a showpiece for soprano Lucy Fitz Gibbon, whose lithe and flexible voice capered through the daunting material with grace, and who brought a touch of theatrical charm to those moments where the text unexpectedly comes through clearly. I think at one point I even heard just a touch of Irish accent when the setting permitted it. Daniel Cohen was conducted without attracting undue notice. John Harbison’s Parody Fantasia, also from 1968,is, alas, not humorous, but a “parody” by analogy with “parody mass”, taking as its material the opening pitches of a hymn tune used by Bach in his Magnificat. It’s an early creation of Harbison’s whose interest rests mostly in the virtuosic demands made of the pianist. It was given a powerful performance (from memory!) by Katherine Dowling, who was clearly equal to the technical demands. I must assume that the last two works, old ones from Harbison and Lerdahl’s early career, were intended as nostalgic gestures to the relative youth of these two figures. For someone who doesn’t share that history, they made for a dry end to the evening. But as the next oldest piece in the festival comes from 1976, and the majority were written in the last 10 years, it is easy enough to forgive this as a gesture to the vision of Harbison and Gandolfi for an FCM that focuses on the continuity of community of the Tanglewood Music Center while looking forward to concerts to come.